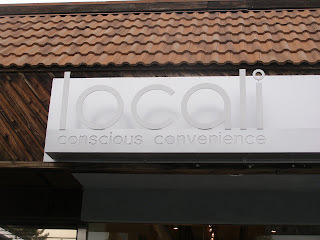 Locali is a great shop in Hollywood which serves up great organic food with tons of gluten free options. The shop is locally owned and operated and is "green" in that it uses energy efficient appliances, reclaimed woodwork, and solar lighting devices. The shop is on an assuming block of Franklin Avenue in Hollywood, right off the Gower Street stop of the 101 freeway. There's ample parking and the staff is SUPER friendly. I asked about gluten free options available in the store and the staff gave me a tour of all of the gluten free options. The store is small, so the tour wasn't too exhausting, but there are lots of unique options. I picked up some interesting items which I'll be blogging about later, but in the meantime shopping at Locali is a great way to support a locally owned business. Best of all, the shop also carries The Sensitive Baker's items. I love the Sensitive Baker (check out my earlier post here), and, no offense to The Sensitive Baker, but Locali's hours are much better than The Sensitive Baker's. I can't make it to Culver City between 10am and 6pm with rush-hour traffic! But don't sweat it, Locali is open until 11pm seven days a week! I would recommend calling ahead to see what Sensitive Baker items they have in stock just to make sure your favorite item is there. Today they had a great selection of chocolate muffins, vanilla cupcakes, and brownies.